The CDV Team... Truly Friends & Family! It has been said that we are a motley crew of various nationalities that have come together to form a big family... Nothing could be more true! Our team is a wonderful mix of Italians, Americans, and a dash of English... all with an incredible passion for what we do. As you read through our bios, you will quickly see how we all came together first through family and friendship, and then began to work together. 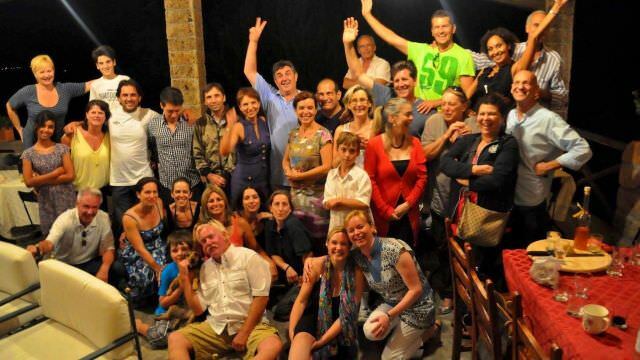 This photo shows it, as if you look closely, you will not only see the CDV team, but also many of the owners of places we visit... wineries, stores, mixed in with a few guests! This is because we truly make what we do one big family! The Founders. It all started in 2006 with an Italian villa and dream that they could give the kind of Italian experience they had always given their friends and family, to others. Michael was a dot.com CEO, and Paola was a CFO. That is, until the big tech crash, followed by 9/11. Not knowing where their next adventure would take them, they found themselves chatting over lunch, when Michael had one of his "hair brained ideas." Within a few months, what became CDV was born! They went on to build the company from a small hobby of sorts into the largest direct experiential tour operator in the country. All the while, never losing sight of the reason they started it all. Nowadays they split their time between Italy and Florida. While in Italy, they are often out scouting new locations, spending time with friends, and popping in on groups. Don't be surprised if you are on a CDV trip, and stop in at a winery only to find Michael and Paola walk out of the owner's house. Or you may be at a restaurant, and they may be helping serve tables! That is quite simply because the places we go as a company are all about personal relationships we build, and those places you visit are usually dear friends. In fact, you are sure to find many extremely unique personal connections to Michael and Paola, as well as the rest of the CDV family. Because to us, this is about way more than business! As far as their role in the company, you might consider Michael the CVO and Chairman, and Paola the Treasurer. You can read more of their story by clicking here. You will quickly pick up on the fact that we are all connected outside of "business". Rocky is a great person to start with to convey this! Like Michael, Rocky grew up in Los Angeles... in fact, just a few blocks from Michael. They never knew one another, but they had a very close mutual friend most of their lives. That friend visited Michael and Paola in Soriano in early 2011, and brought Rocky with. He joined in on one of our week-long cooking vacations in Soriano, and felt an instant connection. Three months later, tragedy struck when their mutual friend passed away. Michael and Paola flew out to California for the funeral, and saw Rocky again. The following day, Rocky and Michael had lunch and talked about the fact that he just couldn't shake the connection he felt with Italy. He was looking for a change in life, and Michael offered for him to come help out during the autumn season of 2011. He did, and nobody has looked back since. Rocky instantly fit in. He began to study Italian with a passion, fully integrate into this new lifestyle, and immediately became a key member of our family. If we had an "official" structure of company titles, Rocky would be the CEO, but he also hosts trips from time to time, and often shows up at locations just to get to know our guests. It all started in 2010 when Michael was in Norcia for a day excursion from Soriano with one of our Alumni groups. He wasn't pleased with the restaurant they had chosen for lunch that day, and was looking for a new one. He walked into the Granaro del Monte restaurant, met the owners, and ended up checking out Palazzo Seneca. Soon after, he met Daniele, who invited him to come spend a few days in Norcia. Daniele was the Business Manager for the company that owned the restaurant and the hotel, as well as a small chain of several other hotels, restaurants and stores. A friendship quickly developed, and they started planning our Norcia weeks, which were inaugurated in the summer of 2011. Since then, Daniele and Michael have remained friends outside of business, and have even gone on scouting trips together in other parts of the country. He has been to Soriano as Michael and Paola's guest, and has even been on some of our tours on our Soriano weeks. This went on for several years until Daniele told Michael and Paola he was looking for a change. Daniele was already family, so it was instantaneously offered that Daniele come aboard CDV as our COO and run all of our operations in Italy. Several years later, Splendido Vacations was formed with Daniele as a managing partner. Splendido is CDV's direct presence in Italy that manages all of our contracts and in-country staff. Alyssa is Michael and Paola's daughter, and Sam is her other half. Like Michael, they are both from the San Fernando Valley in Los Angels (Like, Totally! ), but they now split their time between Florida and Italy with their baby girl, Aria. Alyssa grew up actually speaking Italian before English, but was mostly raised in the States, spending her summers in Italy. Sam, on the other hand, came to Italy for the first time in 2013, but picked up the language in a heartbeat and is sometimes even mistaken for an Italian. Full of energy, and two of the nicest people in the world (OK, Michael is writing this, so there is a little bias), we promise you will absolutely fall in love with them.. Really! Besides hosting weeks, Sam runs the company accounting, and Alyssa is in charge of much of our our marketing and social media. Finally, if you meet them, be absolutely sure to ask Sam to sing whatever he is thinking at any given moment. You won't regret it. Carla is Paola's sister. Like Paola, she grew up tugging at Mamma Eddarerlla's sleeves in the kitchen while soaking up all the family knowledge. Carla is in charge of teaching our Soriano cooking classes, and handles all of the food-related logistics. She is a fantastic cook. In fact, she rivals Paola in the kitchen. If she is teaching one of your classes, you will never stop laughing as you fall in love with her charm. More importantly, she has a way of teaching that you will adore... even if it includes her chasing you around the kitchen with a rolling pin! In addition to her kitchen prowess, she is also a partner of Splendido Vacations, our sister-company in Italy that handles all of our in-country logistics and legalities. Sophie is one of those rare Italians that you meet and simply cannot believe speaks English as a second language. Her perfect British accent, however, is a dead giveaway for the fact that she was raised by an English father, albeit in Italy. She lives just over the hill from Soriano in Viterbo, and travels regularly with our groups to all of our locations... and our guests invariably LOVE her!!! Aside from being in charge of all of our vacation hosts, Sophie does a great deal in contributing to our social media and back-office marketing efforts when we are in the off season. Or should we say "Leeeeeeenda"? A local "Viterbese" from just over the hill, Linda hosts many of our vacations. She has been with us since 2013. One day, she showed up at Michael and Paola's villa prepared for a traditional interview, handing a resume to Michael. Without a glance at it, Michael set it aside and told her there could be nothing on the resume that could apply to who we are and what we do. As she learned what we are about, the relaxed expression spoke volumes, and what started as a stiff interview ended in hugs. She was instantly a member of the family. From the moment Linda began working with us, it was clear that she was indispensable. Her charm is addictive to the point that within minutes of meeting her, absolutely everyone falls in love with her. Linda's English is much better than she believes it to be, and as such she is always a bit self-conscious about it. So she carries a book with her everywhere she goes, jotting down new words and colloquialisms that she learns along the way. As many of our guests pick up on this, she often learns some more "interesting" phrases. Considering that we have guests from The USA, Canada, The UK, Australia, South Africa, New Zealand, etc., don't be surprised by some of the more unique phrases Linda knows! Sergio is Paola's brother, and has lived all his life in Soriano. Before we were doing what we do, he was driving large tour buses all over Europe for a major tour company. He loved what we were doing, so when we had need for a full-time driver, Sergio stepped up and filled the role. He is our primary driver for our Soriano weeks, as well as our location manager throughout Italy who deals with the transportation logistics that assure all our excursions go flawlessly. (We promise a Katia video soon!) Katia is perhaps the sweetest person you will ever meet. She assists in our kitchen with such grace. Everyone falls madly in love with her, despite her limited English. One day she told us she loved being with our guests so much, that she wanted a chance to cook for them. So we brought a group to her private family cellar (converted into a kitchen) and she made a wonderful dinner for us. We have been having dinner with her there with our guests ever week since!